Half way through March and Spring has yet to show its face. The dreary weather seems to also be affecting my reading ability. I managed to only get through one book last week and boy was it a doozy. I can't tell people enough how much I LOVED Red Queen by Victoria Aveyard. You can check out my review here. I'm pretty sure this week is also going to be a slow reading week. Mini JG turns THREE on Saturday!! I still can't believe it. So the focus will definitely be on her. Although, reading was a bit slow, I was fortunate enough to get some book mail last week. My Valentine's Day prize from The Morning Show Toronto arrived. 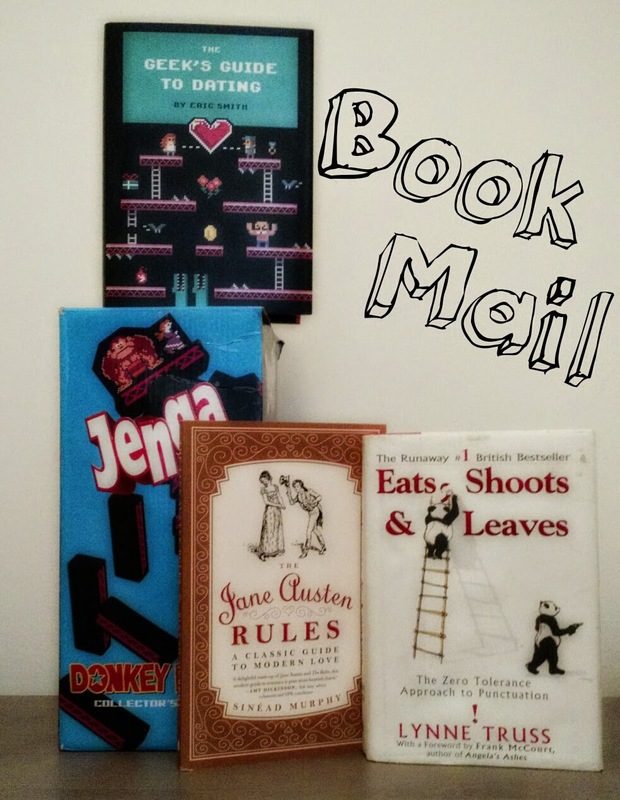 I received Jane Austen Rules by Sinead Murphy & The Geek's Guide To Dating by Eric Smith. Both look to be fairly quick reads filled with hilarious dating tips. The third book, Eats, Shoots, & Leaves by Lynne Truss was given to me by my cousin. Something that he's had laying around in his office for I don't know how long. He doesn't even know how it got there... What I found hilarious about the whole situation (beside's the book's name) was the author of the book's forward. It was written by Frank McCourt, author of Angela's Ashes. I read Angela's Ashes when I was in grade 8. It was the very first memoir I ever read and I've been hooked on them ever since. In case you were wondering, Donkey Kong Jenga did not come in the mail. It was just a fitting item to add in the photo given the book covers. Enjoy your new reads. I really enjoyed The Children's Act and Orphan Train. Happy reading! Thank you Jennifer. We seem to have similar taste in books. I hope to get to Orphan Train & Children's Act soon.